Homes, furniture and dishware designed in French provincial style are dominated by symmetry that is softened with subtle, nature-inspired ornamentation. The aesthetics of the French provincial style, which were established and developed in the 17th and 18th centuries, have been revived during modern times by those with a reverence for classical European design movements. 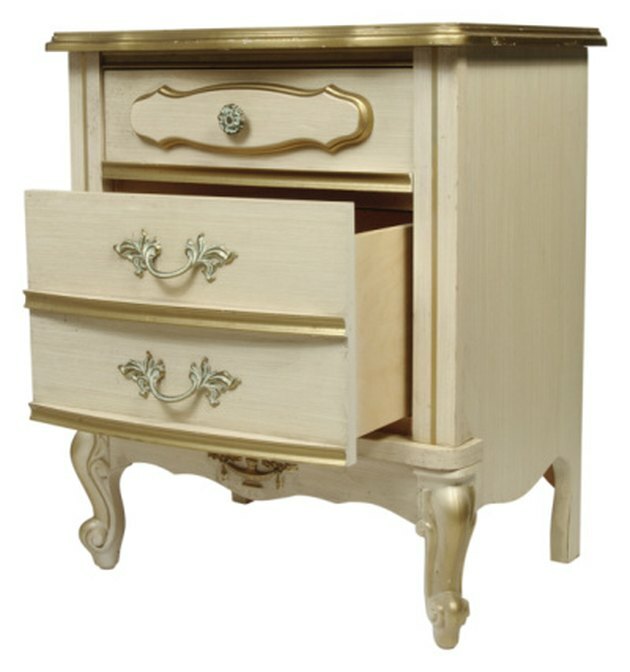 Refinish wood furniture that has fallen out of favor to reflect the simple but elegant traditions of France's countryside communities. Balance and tasteful ornamentation are key components of the French provincial style. Unscrew and remove any knobs, handles or other fixtures. Strip the original finish from the piece using a type of stripper that is appropriate for the type of finish. Use lacquer thinner for lacquer, denatured alcohol for shellac, and paint and varnish stripper for paint or varnish. Apply the stripper and leave it to sit as directed in the instructions, then remove the constituted finish using tools such as a putty knife, steel wool and old rags. Wipe down the piece with mineral spirits to clean all surfaces and remove all stripper residues. Leave the piece to dry. Sand down all surfaces, using 180-grit sandpaper. Wipe away the remaining dust with a tack cloth. Paint the piece with two coats of primer, using a paintbrush, a mini roller or a sprayer. Follow the coats of primer with a coat of very light-colored paint. Choose a light color that goes well with the home's décor. Paint over the light color with antique white paint. Apply a second coat if the first coat appears blotchy. Leave the antique white paint to dry, then lightly sand along corners, edges and high points with 320-grit sandpaper. Lightly sanding will reveal some of the slightly darker paint beneath, imbuing the piece with a sense of age. Draw or trace a simple, linear border pattern on a piece of vellum paper. The pattern should have suggestions of nature, such as flowers, leaves, vines or seashells. Cut out the pattern with a craft knife to turn it into a stencil. Tape the border stencil successively around the edges of the piece so that borders on one half of the piece mirror the borders on the other half. Paint liquid sandpaper sandpaper within the image, using an artist's paintbrush. Paint the stencil with a darker shade of the same paint color that was used beneath the coat of antique white, so they match. Replace any knobs, handles or other fixtures with ones that have floral or natural ornamental embellishments.